It’s 10 o’clock. Do you know where your Mokis are? A bright and colorful physics puzzler, iBlast Moki sets out to provide you with all the tools necessary to send the blobby little Mokis back home, namely, a mysterious portal and a bunch of bombs. Gameplay is a little like combining Rolando with Monster Crush. You are trying to get the Mokis from point A to point B, using bombs to launch them towards the goal. Place the bombs, then press start to initiate the action. Unlike blast-happy games filled with unnecessary, but thoroughly entertaining, destruction, iBlast Moki employs bombs with all the delicacy of a veteran demolitions expert. Strategic placement is key, as you don’t have very many bombs at your disposal and how close or far away they are will affect their blast power. Navigating the level is very smooth and well-suited to the iPhone’s touch screen. Drag bombs to place them and make liberal use of the camera drag and pinch-zoom mechanism to survey your handiwork. The delay timer for the bombs can be set with a quick turn of the pink dial around a selected bomb, and any mistakes can be corrected with a quick hit of the reset button. There is usually a lot of trial and error involved before you find a successful bomb set-up, but most of the levels are very short, so it’s not a big deal to redo it over and over again. The game comes with 85 levels and 7 different world settings, each with their own particular quirks. They do go by very quickly, they’re just the tip of the iceberg. In addition to the robust puzzles it already provides, iBlast Moki also comes fully equipped with a robust level editor that allows you to create your own levels and, with a Plus+ user account, you can also play other user-created levels as well. It’s a surprising and delightful bonus for an otherwise simple game. Great sound and brilliant graphics round things out. The Mokis themselves are packed with a lot of character and charm, and the various worlds are visually distinct in a striking and pleasing way. The initial tutorial levels take their time in introducing you to the action, but once you’ve gotten the hang of things, the game becomes a delightful diversion. The brief level lengths make it easy to sneak in a quick game, and that’s really the best way to enjoy it. It’s a satisfying snack, but play it for too long and the action starts to become repetitive and a little dull, so make sure to enjoy the Mokis in moderation, but for the price, this is a well worthwhile purchase. iBlast Moki HD is a separate app which sells for $2.99 in the App Store. 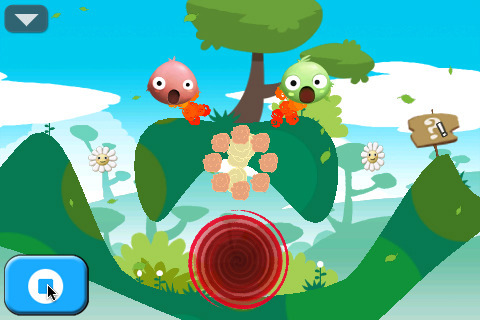 AppSafari review of iBlast Moki was written by Tracy Yonemoto on June 26th, 2010 and categorized under App Store, Games, Physics Based, Puzzler. Page viewed 3457 times, 1 so far today. Need help on using these apps? Please read the Help Page.